Admins have access to a wealth of information when monitoring Manager Requested Feedback progress. This is a quick overview of the features available. Date range picker - Currently we default to date ranges of 30 days, 3 month and 6 month time periods. 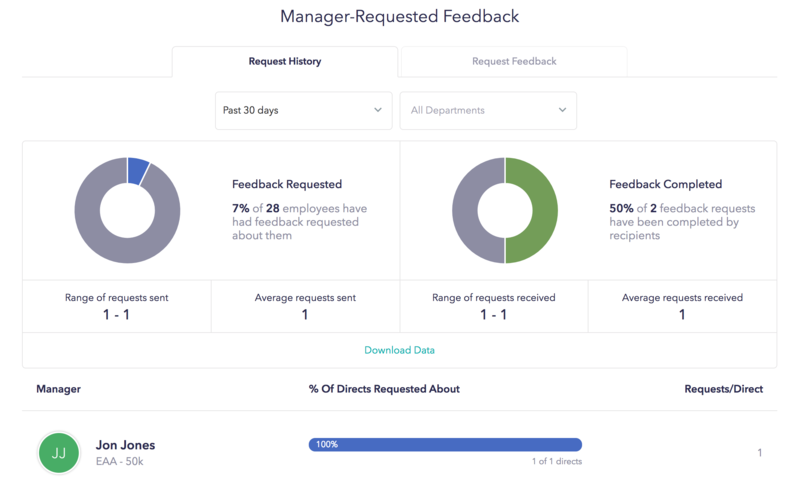 Statistics - Range of requests sent by managers/ requests received from managers, average requests sent by managers/requests received, % of people whose manager made requests about them, % completed MRF. Breakdown of individual managers status with their directs - This surfaces whether or not a manager has sent requests about their directs. If you click on the manager's row, it will expand to show the status of each individual request. Raw data download - If you click "Download Data" it will compile all MRF status information then send it to you via email. This process can take 5-10 minutes. Now you'll have all the information you need to have an at a glance view, as well as all the raw data you need to slice and dice it any way you choose. Check out the MRF Dashboard!